It’s a holiday weekend. Yeah. I have an extra day in the shop on Monday that I intend to fill building a quick desk with my younger brother. 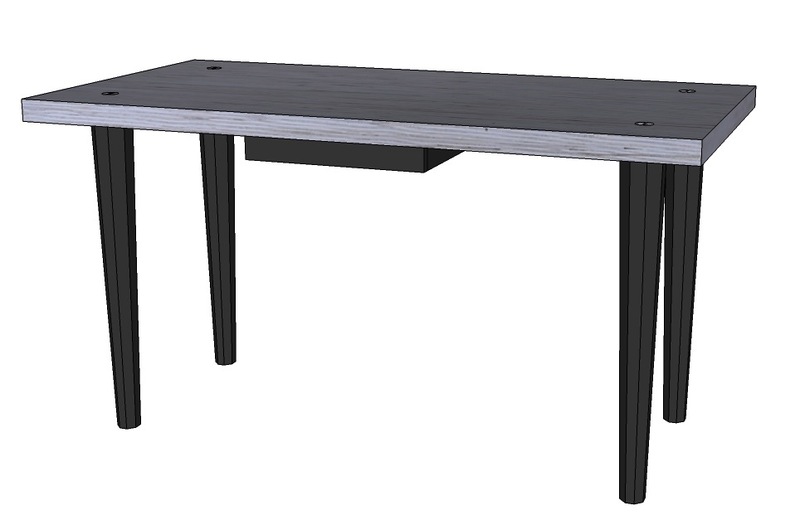 He’s looking for something a bit toward contemporary and I’ve sold him on using LVL (Laminated Veneer Lumber) for the top with legs that are simple to make; he wants inexpensive and quick. The most time spent – at least I hope it takes longer than other parts – is time building a pencil drawer. I took two hours to rip, square and assemble the pieces of LVL for the top one night after work. That includes time spent watching glue dry. The process is easy. Here are the steps in case you want to play along (or build something similar down the road). I began with two LVL beams that were 1-3/4″ x 11-7/8″ x 10′-0″. 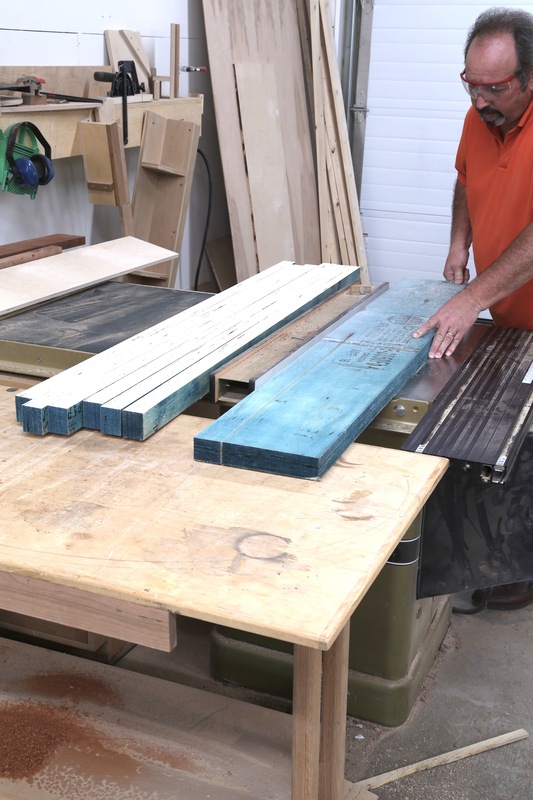 After chopping the beams in half lengthwise, I set up at the table saw to rip each piece to 2-1/8″. Of course, one edge was ran over the jointer to give me a square edge to start. Using a 50-tooth combination blade, LVL cuts easy. 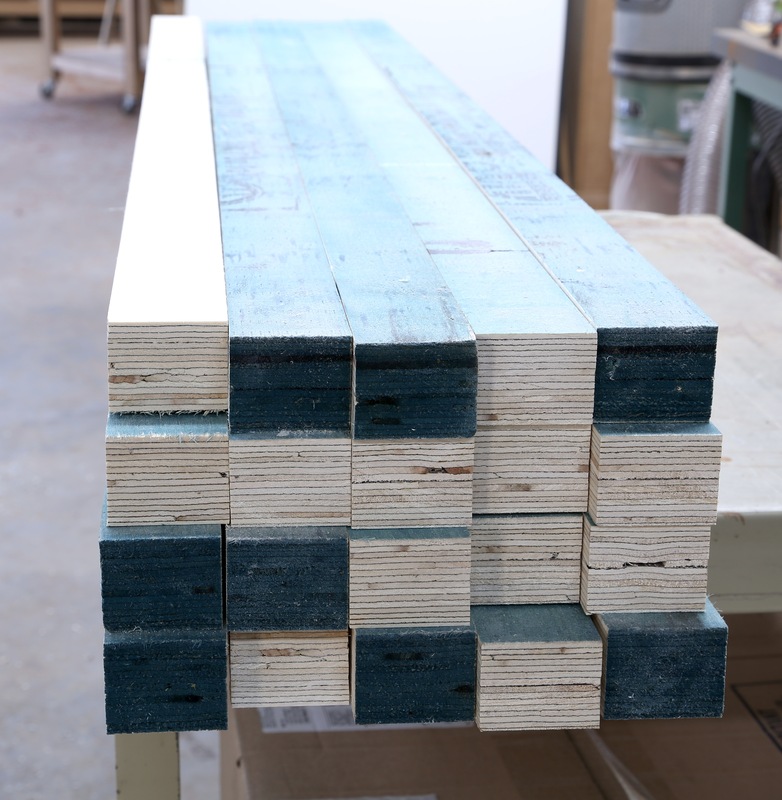 The beams I purchased had a bluish painted surface, as you can see in the photo. That worried me little after making the jointer pass. Then after ripping the pieces and turning them on edge, you begin to see the final surface. To make up the 30″ in width needed to the desk, I ripped all four half beams, which produced 20 strips that were 1-3/4″ x 2-1/8″ x 60″+. From the table saw, I returned to the jointer to true one of the two yet-painted edges to provide a solid glue surface. A single pass flattened all but two of the pieces. Those two pieces were areas where the lamination overlapped causing a bump in the face. I ran them a second time in order to achieve a flat face. You still see bluish paint in the left-hand photo because only one face has been flattened (all faces run over the jointer knives are downward facing, waiting for the planer. A ride through the planer was so easy. All I needed was to flatten the second face for glue. The planer I used is setup with a spiral cutterhead. Even though there were no problems with the three-knife arrangement at the jointer, the planer surface was smoother. 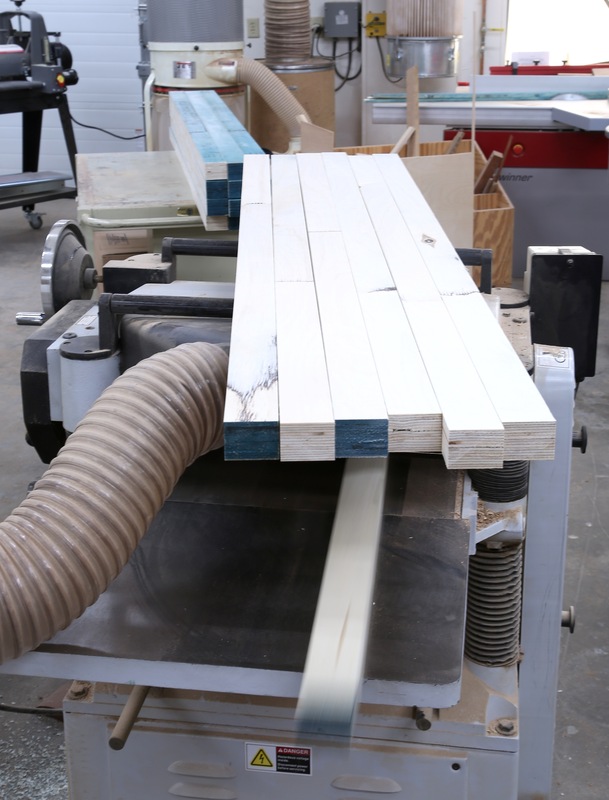 (This is why, when asked, I suggest that the planer have the spiral cutter, but it’s not that important on your jointer – the jointer is seldom the last surface of your work.) The first pass was great except for, you guessed it, the two pieces that needed the extra pass at the jointer. When those two were feed through the planer, the final surface was untouched in a couple places. A send pass through the planer was required, but only for those two pieces. To my surprise, the most difficult process in assembling the two planks for the top was the glue-up stage. Spreading glue on the 19 pieces (yep, I had one strip left over after attaining the 30″ width) was a pain. I decided to lay the strips out as if I were gluing panels for a case side. With the finished face up, I then rotated each piece to a glue face. With the pack tight together, I squeezed glue up and down the face leaving small lines covering the surface. I spread the glue using a thin scrap of wood. Scraping along the length was no good, but across the pieces worked like a charm. With one side gooey, I flipped the strips abd slathered up the second side. I was amazed at how sticky the pieces were as I tried to align the ends – I needed a mallet to move the individual pieces. Than goodness I assembled the 19 pieces in two separate groups. When finished, I added clamps and let the half-tops set. All in all, I used almost 3/4 of a quart of glue. Out of the clamps in 45 minutes and all that was left was to clean the squeeze-out off and make a pass through the planer to level the two surfaces. When slid together – I still need to assemble the two halves – you get a good idea of how the top looks. My guess is it’s even better when a bit of finish is applied. Next week I’ll walk through the legs. Get it?